Within the last century, works of incredible craftsmanship attributed to African artists have captivated Western collectors and museums. While African art has become increasingly desirable and mainstream, its display in the museum context remains problematic because of a lack of understanding of indigenous Africans’ notions of art and aesthetics, which challenges Western-style connoisseurship. This illustrated lecture reflects on the complexities in African art’s creation and use, to its ultimate commodification in the West. Nii Quarcoopome received his doctorate in African art history from the University of California, Los Angeles. He entered the museum profession in 2000, beginning first as curator of the arts of Africa, Pacific and the Americas at the Newark Museum before joining the Detroit Institute of Arts (DIA) as department head of Africa, Oceania and Indigenous Americas in 2002. He was promoted to Co-Chief Curator in 2012 and is currently a member of the DIA’s leadership group. Quarcoopome boasts an extensive publication record and several prestigious national grants, fellowships, and awards, notably from the National Endowment of the Arts and National Endowment of the Humanities Planning and Implementation Grants for his 2010 groundbreaking exhibition, Through African Eyes: The European in African Art, 1500-Present, which received the American Association of Museums’ highest honor for overall excellence and a Detroit City Council Resolution. He has wide-ranging experience consulting on African art collections and gallery reinstallation projects, notably at the Minneapolis Museum of Art, Smithsonian’s National Museum of Natural History, Memorial Art Gallery (Rochester, NY) and Nelson Atkins Museum (NAMA). He recently reinstalled the Nelson Atkins Museum’s African gallery to conclude a four-year long shared curatorship between the DIA and NAMA, the first in the history of American museums. 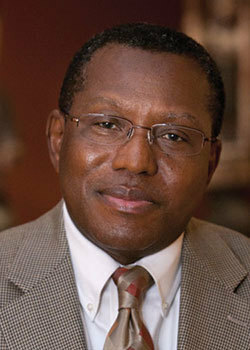 For close to a decade, he served as board member and then President for the West African Museums Project. His current academic focus includes issues affecting African national museums, cultural patrimony, and provenance research.